Welcome to the Pondside Village Homeowners Association Website! Pondside Village is a gated townhome and condominium community located in Greenburgh, New York, in the heart of suburban Westchester County. Comprised of distinctively designed two and three bedroom Georgian-style townhomes and a luxury mid-rise one and two bedroom condominium building, Pondside is renowned for its award-winning landscape architecture and its beautiful vistas. 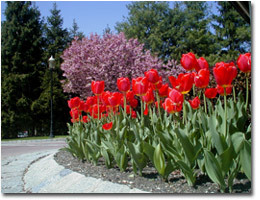 The artfully landscaped grounds, ponds and variegated foliage provide the backdrop for the quiet community atmosphere that is an integral part of the Village. Two pools, two tennis courts and an exercise room-equipped clubhouse are some of the amenities which contribute to the overall appeal of the community. In addition to the charm and character that make Pondside Village so special, owners enjoy great investment potential in a convenient location. All this distinguishes Pondside Village as a highly desirable place to live. Pondside Village was built by the Ginsburg Development Corporation 1989-1994. The Pondside Homeowners Association has been in existence since 1993, and its Board of Directors has been instrumental in managing Pondside's internal and external affairs since its inception. 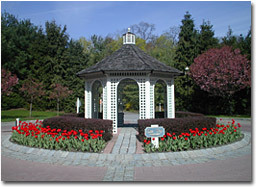 Pondside Village is composed of four separate condominiums: Village I, Village II, Village III and Pondside Club West. Each condominium is governed by an elected Board of Managers, which has the responsibility of establishing and enforcing rules and regulations specific to the individual condominium, overseeing the maintenance of the buildings of the condominium and establishing the budget and the common charges for the condominium. The Board of Managers has the authority to assess the homeowners as necessary. 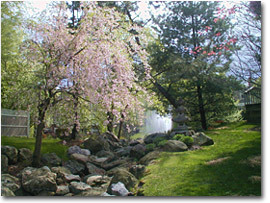 The Pondside Homeowners Association Board of Directors is the governing body of the community as a whole, and has the responsibility of maintaining the clubhouse, gatehouse, the recreational facilities, the roadways and driveways, the grounds and ponds, drainage and other "common" elements of the community. It also establishes rules, regulations and standards pertaining to parking, sanitation, use of the amenities (pool, clubhouse, exercise room, etc.) and unit owner responsibility in preserving the overall appearance and style of the community. The Board of Directors is comprised of representatives chosen from the Boards of Managers of the respective condominiums. There is one Director from Village I, one from Village II, three from Village III and two from Pondside Club West. Detailed information concerning the organizational structure of Pondside Village is contained in the Bylaws of the Pondside Homeowners Association.